We all love change, n’est-ce pas? Being an agent for change. Driving change. Creating new ways of working, processes, business models… all that is great and something most business people would say they enjoy and stand for. So why is it that when change “happens” on a larger scale, many people have a strong degree of resistance to it, find it hard to participate in a constructive way. Even when they know and believe that the path the business is currently on, is no longer viable? Surely only those who are living in the past want for things to remain as they are. Most people I know consider themselves agile, flexible, modern, driven, adaptable… what is it that creates defiance to new processes, structures, software in them? When asked about why he thought everything was so annoying, a friend, let’s call him Paul, told me: “Well, I am not involved, I am just told I will have to do x, y and z in the future”. A “they” vs. “us” or worse, “me” perception and attitude is a killer to constructive change. See, people like Paul are used to running with their part of the business. They have freedom to move in their own field of expertise. If Paul’s business is now going through a major change process, Paul will not have the same degree to decide, but the capital mistake the programme owner, senior management or whoever has initiated the change process has made is lack of involvement. Paul doesn’t feel ownership, he has not been able to contribute and his rather normal reaction to a fait accompli, which has been created by someone else, but which strongly impacts his part of the business is at least to stall. Paul crosses his arms and says: “No one spoke with me about this, how can “they” know this works?” – and finds 10 reasons why the new approach will be utterly useless. At this point, this particular change process needs to be considered a failure. You want someone to embrace an idea: you need to at least convince that person. But much better: involve them in the creation of the idea, make them own it. Every wise woman will know how to influence her partner, so that he considers major ideas to be his own. This is no different in business: you make me want to do something? I will invest myself, time and effort and I will then live new developments and motivate and convince others. Of course, communicating with people, bringing them on board is time consuming at the start of a programme or project when management expects quick wins and results. But there really is no alternative, anything else is lethal for the outcome. Respect needs to be shown to those in the business who have knowledge, no matter their title or place in the hierarchy. All this is not new and it isn’t rocket science. In fact, it was taught in universities quite a while ago. The digital world brings a lot of truly new factors with it, this isn’t one. Today, techniques like workshopping, prototyping and early stage UX testing can help and they provide powerful tools to expedite changes and engage executives, developers, anyone involved alike. Bring on Mr. John P. Kotter and his book “Leading Change”, written in 1996. It is still valid. 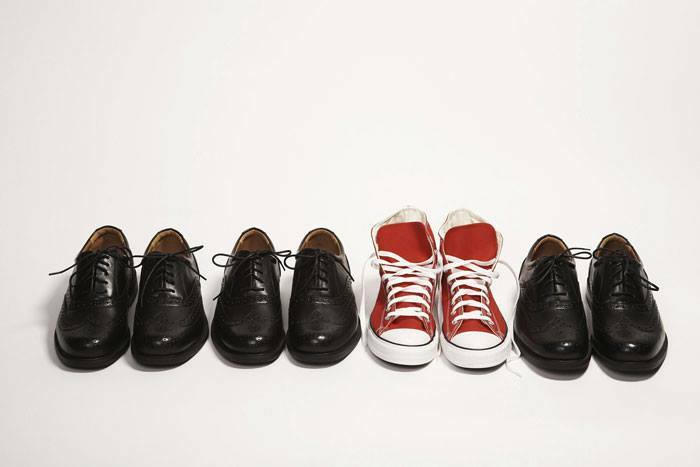 Here are his 8 steps to be taken in the right order as a recommendation for leaders who need to successfully tranform businesses. 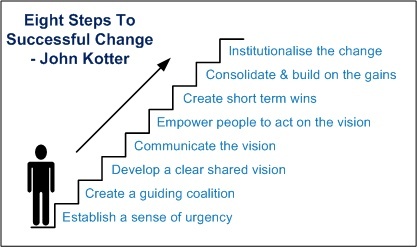 An article by Mr. Kotter from 2007 really sums this up, and I encourage anyone involved in a changing/evolving organisation to read it, he concludes with: “In reality, even successful change efforts are messy and full of surprises. But just as a relatively simple vision is needed to guide people through a major change, so a vision of the change process can reduce the error rate. And fewer errors can spell the difference between success and failure.” (https://hbr.org/2007/01/leading-change-why-transformation-efforts-fail). Having said all that: there’s also attitude to consider. Paul might have not been such a sceptic if he worked in a collaborative environment. If a company’s culture is toxic, lacking trust on all levels and cynicism prevailing in every day business life, change will be much harder to manage, than in a trusting, positive, hands-on environment. Kind of obvious, really. Running workshops including gaming techniques to create results rather than “meetings” is something we introduced as part of the agile software development process. Soon after that, I noticed that my motivation to participate in “normal” larger meetings in other parts of the organisation decreased more and more. Why? I guess I just didn’t feel as engaged, I felt everything was too theoretical and I also thought I was wasting my time as often I switched off for quite a long time. So, I started using simple workshop and gaming techniques more and more in reviews, in working through complex inter-departmental issues and every time it felt that valuable insight was gained. None of these meetings had anything to do with software or other technology developments by the way. Therefore, when this colleague from a different part of the organisation asked me if we could “workshop” this topic next time, it made me pretty happy because we had made an impact on desired ways of working without imposing anything top-down. Well, of course you can’t run every meeting as a workshop, but if you are looking to gather and group issues related to a broader topic and then drill down on the real core of a problem, when you have more than, say, at least 3 participants, they help. I’d argue that workshop techniques help you prepare better for meetings (if only considering the material required), but you will have to be organised, moreso than just walking into a room and saying “right, what’s this meeting about now” when you’re supposed to be running it (and we have all done that). good judgement of the participants – how do they function as a group? Is there trust? So if you like what you read and saw: happy workshopping! But what does it mean to go through with it, to live digitalisation? Hopefully, some of my thoughts can trigger an exchange of experiences about how digitalisation impacts on structure, people, culture, execution times, the pull between time intensive projects and expectations on line results? How do you lead digitalisation and what is different from “projects” as we all know them? How do you ensure you continuously challenge your ways of working, your business model and value chain? Do you need to create “challenger” companies externally to ensure you move fast enough? How do you take those employees and other stakeholders not so comfortable with change, technology and flexible roles with you (and what can you do when that’s not possible?). How do you deal with detours and, occasionally, failure (in a world without blueprint, this is inevitable). How do you cope with decision-making in an uncertain environment and about things (aka technology) you might not be entirely familiar with? Stakeholders will need to be managed, but how much time should you invest? Does it really have to cost THAT much (time/money/equipment/project working space?)? So, thank you for reading – and for your contributions.